Ornette Coleman, the alto saxophonist and composer who was one of the most powerful and contentious innovators in the history of jazz, died on Thursday morning in Manhattan. He was 85.
Who by fire? And whither thence without a predetermined path? Apostasy Suite is the culmination of a self-professed fascination with the notion of purification through burning, (partly) transposed from a religious context into repudiation of the external imposition of “any teaching or imprinted belief system…faith in god(s), democracy, money, body image” on the individual, which Chester Hawkins characterizes as sedative, formative American mythology. Hawkins, who just retired the Blue Sausage Infant moniker he bore since 1986, molds “dynamic sculptures,” representing a dynamic sense of individualism, out of tone and static. Comprised of six separate live performances, trance reaching for transcendence through proxy self-immolation, Hawkins marshals an impressive array of equipment, from modular synthesizer and mobile phone to lapsteel and prepared vinyl, with which to stoke the flames. He opens by ripping apart the Catholic Easter Mass and singeing the pieces. A sizzling “Equinox” settles into a high register, Oldfieldian riff – exorcism? – before bells ring in an “Intifada” hammering an urgent alert on pretend bass guitar. “No Body,” the shortest performance at less than six minutes, is pacific, angelic in fact – ecstasy through disembodiment? The ultimate upheaval achieved, “Exterminator Pump” seems to revel in newfound freedom and the Mass comes to its final “Dissolution,” a twenty-minute inverse auto-da-fé. An abstract, highly personal liberation ritual. For the last 20 years, Norwegian free jazz drummer Paal Nilssen-Love has built a formidable reputation as one of the world’s most energetic and prolific musicians, known for bands like The Thing, OffOnOff, Ballister, Hairy Bones, Peter Brötzmann‘s Chicago Tentet, and Original Silence, as well as collaborations with musicians including Arto Lindsay, Jim O’Rourke, Otomo Yoshihide, and many others. In 2013 Nilssen-Love launched his own big band ensemble, Large Unit, pulling together an international ensemble of 11. Large Unit manifests as an intense powerhouse force on stage, but also veers into more subtle and textural passages. The group includes members from Finland, Sweden and Denmark. In other words: Nordic music at its most powerful. Sabisha Friedberg presents a live mix of the third and final movement of The Hant Variance as a quadraphonic experiential piece. Originally recorded with Peter Edwards in a custom-tuned environment at EMPAC, advanced multi-channel recording techniques were used to capture a precise configuration of spatialized sound sources. This finale, the most symphonic in it construction and melancholic in its tonality, is the resolution to the first two movements, released on ISSUE’s Distributed Objects imprint as the 2xLP The Hant Variance. An essential member of the experimental and avant-garde music scene in New York, composer and percussionist Lukas Ligeti talks with Jake Nussbaum about his unique poly-rhythmic and non-western pieces. The interview is conducted on the eve of his 50th birthday celebrations in New York, on June 11, 2015 at the Austrian Cultural Forum New York and on June 14, 2015 at Roulette, Brooklyn. The only thing predictable about the St. Paul Chamber Orchestra’s Liquid Music series is its unpredictability. Announced today, the 2015-16 season features new artists presenting new music, including world and regional premieres, in new spaces through new partnerships. Liquid Music will travel from Aria in Minneapolis to the Walker’s McGuire Theater, Bedlam Lowertown, the Ordway Concert Hall, the Fitzgerald Theater, the Walker’s galleries, the Hill Reference Library and the Guthrie’s Dowling Studio in a dizzying sonic journey through the cities. 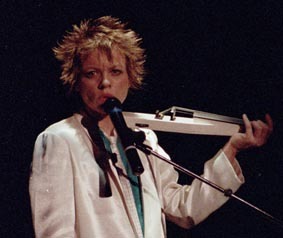 Performances will include chamber music, spoken word, dance, electronics, multimedia/visual design, a wordless opera, puppetry and a solo night with Laurie Anderson.